A new book by a retired Voice of America journalist traces former President John F. Kennedy’s lifelong relationship with a gay man he met while the two were attending Choate Rosemary Hall in the 1930s. The son of a Pittsburgh physician, LeMoyne "Lem" Billings, was initially a year ahead of Kennedy at Choate. But the bond between Billings and Kennedy became so strong that Billings stayed back a year so that he and Kennedy could graduate from Choate together in 1935, Pitts said. Pitts said that Billings and Kennedy’s relationship at Choate was born out of a mutual dislike of authority and privilege that the school represented to them, Pitts said. "They both had overachieving, popular older brothers," Pitts said. "They were both in trouble a lot, and they both had a similar sense of humor." While attending college — Billings at Princeton and Kennedy at Harvard — the two men would frequently meet in New York City to socialize. And when the Japanese bombed Pearl Harbor in December 1941, the two men were playing football near the Washington Monument, Pitts said. The bond between Kennedy and Billings was so close in later years, Pitts writes, that Billings had his own room at the White House during the Kennedy presidency and spent most weekends there. That prompted a frustrated Jackie Kennedy, who liked Billings for the most part, to comment to a White House usher, "He (Lem) has been a house guest every weekend of my married life." A new book by a retired Voice of America journalist traces former President John F. Kennedy’s lifelong relationship with a gay man he met while the two were attending Choate Rosemary Hall in the 1930s. 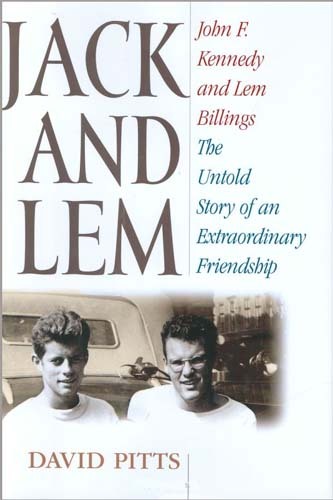 Author David Pitts’ book "Jack and Lem: John F. Kennedy and Lem Billings: The Untold Story of an Extraordinary Friendship" claims that Kennedy turned down sexual overtures from his close friend, Billings, who remained one of the president’s closest confidants until Kennedy’s death in 1963. The book arrived in stores earlier this month. Billings died in 1981, and in an oral history that was done for the Kennedy Library that Pitts used in writing the book, talked about what his friend had meant to him. "Jack made a big difference in my life," Billings said. "Because of him, I was never lonely. He may have been the reason I never got married." Billings was working as a New York City advertising executive the day Kennedy was assassinated in Dallas. He would continue to work at the advertising firm, Lennen & Newell, for another decade after Kennedy’s death, but Billings’ life would never be the same, Pitts said. "He was in a very deep depression; sometimes didn’t want to live," Pitts said. "He never really came out of it." Early portions of the book were the result of research that Pitts did at Choate’s archives. The school’s archives have a vast collection of material, including correspondence between school officials and Kennedy’s parents, Joseph P. Kennedy Sr. and his wife, Rose, as well as Kennedy’s yearbook, said Judy Donald, the school’s archivist. Donald fields about a half-dozen requests a year to look at materials on Kennedy in the school’s archives, although interest in the former president’s high school years increase during presidential election years. "There is a lot of interest, a real spike," Donald said. "We get maybe double the amount of requests to look at the material." When fielding requests from individuals seeking to use the archives for research, Donald said she has to take them at face value. "I don’t know what they’re ultimately going to write, so it’s not like you can censor someone ahead of time," she said. "There are some materials, like grades, that are confidential, as they would be for any other student. But everything else is out there in public." The son of a Pittsburgh physician, LeMoyne "Lem" Billings, was initially a year ahead of Kennedy at Choate. But the bond between Billings and Kennedy became so strong that Billings stayed back a year so that he and Kennedy could graduate from Choate together in 1935, Pitts said. Pitts said that Billings and Kennedy’s relationship at Choate was born out of a mutual dislike of authority and privilege that the school represented to them, Pitts said. "They both had overachieving, popular older brothers," Pitts said. "They were both in trouble a lot, and they both had a similar sense of humor." And often it was that sense of humor that got Billings and Kennedy into trouble. They were members of a group of practical jokers at Choate at the time called "The Muckers." The group’s pranks, while tame by today’s standards, nearly got Kennedy expelled from Choate. "The headmaster at the time, Seymour St. John, wouldn’t accept any rebellion, so just being part of that group was a problem for JFK," Pitts said. Kennedy’s father, who was a famous Hollywood movie mogul at the time, interceded on his son’s behalf with St. John. To help smooth things over with the headmaster, Joseph P. Kennedy replaced the school’s silent film projector with one that allowed Choate to screen motion pictures with sound in the basement of the school’s chapel. Kennedy used his Hollywood connections to keep a steady stream of first-run films coming to the Choate campus as well. In the years following their time at Choate, "Lem Billings keeps showing up throughout JFK’s life," Pitts said. While attending college — Billings at Princeton and Kennedy at Harvard — the two men would frequently meet in New York City to socialize. And when the Japanese bombed Pearl Harbor in December 1941, the two men were playing football near the Washington Monument, Pitts said. "At first, I thought this would be a guy who would have tremendous political influence behind the scenes," Pitts said. "But theirs was a different kind of friendship." The bond between Kennedy and Billings was so close in later years, Pitts writes, that Billings had his own room at the White House during the Kennedy presidency and spent most weekends there. That prompted a frustrated Jackie Kennedy, who liked Billings for the most part, to comment to a White House usher, "He (Lem) has been a house guest every weekend of my married life." Kennedy tried several times to offer his friend a government job, including a posting as ambassador to Denmark and as head of the Peace Corps, a job that the president’s brother-in-law, Sargent Shriver, would ultimately take. But Pitts said Billings rejected Kennedy’s offers, fearing that working for his friend would alter their friendship. The kind of relationship the two men had could probably never have taken place in today’s scandal-obsessed culture, Pitts said. "The press would have gotten a hold of it and would have run with it," he said. But Pitts said he found no evidence that Kennedy’s parents or other family members tried to convince him to break off his friendship with Billings because of the stigma associated with homosexuality. "In the letters that Joe Sr. wrote, he called Lem ‘a second son,’" Pitts said of the family patriarch. "Joe thought that Lem was good for Jack, that he’d keep him out of trouble." In fact, after Kennedy’s assassination, Billings remained close to the family, even accompanying Jackie Kennedy and her children to a 1965 ceremony to dedicate a memorial to JFK in Runnymede, England, Pitts said. And Billings worked on Robert Kennedy’s 1968 presidential campaign. Pitts wrote the book without interviewing any members of the Kennedy family. "But they never tried to stop it," Pitts said. Some of the photographs that are found in the book came from Robert F. Kennedy Jr., the late president’s nephew, he said. Pitts said while the public’s interest in the book may be piqued by Kennedy’s relationship with a gay man, the story is about much more than that. It’s the story of a really close friendship — and one of the guys just happened to be what we think of today as gay," Pitts said. Luther Turmelle can be reached at lturmelle@nhregister.com or 789-5706.